Situated around 37 kms from the Dehradun city is the beautifu hill station of Mussoorie. One of the most sought after tourist spot, Mussoorie the “Queen of Hills” came into existence in the year 1827 when an adventurous army officer named Captain Young discovered it. Being at a height of around 7000 feet, the cool and calm environment along with the picturesque natural weather makes it the perfect tourist destination not only in Dehradun but in overall Uttarakhand. From the top, one can enjoy the Mussoorie sightseeing places and view the Himalayan ranges, Bandrinath, Kedarnath, Nandadevi and other beautiful snow clad mountains. Also because of the various hill tops it’s a perfect place for the trekkers. During winters tourists enjoy the snowfall in Mussoorie and also have great fun throwing snowballs over each other. There are various tourist attractions in Mussoorie that can be enjoyed such as Camel’s back, Lal Tibba, Municipal Garden, Gun Hill and also the Mall road to stroll. There is also the old and famous Tibet Market for purchases of cheap and exciting fancy clothes and items. While travelling towards one finds an exciting water lake which is around 6 kms from Mussoorie Dehradun India. This is a cool picnic spot developed by MDDA where one can enjoy boating in the water lake along with food and snacks. Bhatta and Jharipani falls are situated around 7-8 kms from Mussoorie these are great picnic spots where one can find amusement and bathing ponds. The Shiv Mandir along the way to Mussoorie is about 13 kms form Dehradun. This is one of the popular temples near Mussoorie which is flocked by thousands of devotees all over India. The Camel’s Back Point gets its name from the life sized rock which resembles a camel’s back. The camel’s back road is a 3 kms stretch starting from the Rink in Kurli bazaar and going upto the Library Bazaar and is an exciting ride which can also be enjoyed on a pony. Walking through the road the tourists enjoy taking pictures of themselves and the beautiful nature around. Moving 2 kms along the Waverly Convent road you come across the pleasant and attractive Municipal Garden also previously known as the Botanical Gardens which was founded by Dr. Fackner. One can see beautiful flowers blooming in and around the gardens which creates a magical environment. People also enjoy the boating in the lake and freshen up their minds up! The highest hill point in Mussoorie from where you get to see a panoramic view of the Himalayan ranges, Gangotri, Srikantha and others. You can have a wonderful view of the entire market place of Mussoorie along with the cool breeze flowing through! Also Known as Lal Tibba or Depot Hill, one can reach uphill in around half an hour by walk or you can take a exciting ride by trolley to the top. Starting right from the Library point upto the Cinema place is the buzzing market place. You could enjoy the food in the restaurants especially the Chinese momo and noodles and fashionable clothes and accessories to buy. One of the oldest markets in Mussoorie along the Mall road is the Tibetan market. You can find a variety and choice in the Tibet market for fancy clothes and items which can also be taken as gifts for your loved ones. Among the tourist spots here are the Kempty Falls, Quail Sanctuary, Dhanaulti, Surkanda Devi, Nagtibba, Bhadraj Temple, and Yamuna Bridge. One can also find a number of excellent hotels, resorts and restaurant to enjoy the stay here. The Kempty fall is around 15 kms from this hill station and is one of the main attractions of the place. Visited by thousands of tourists all round the year it consist of the waters bouncing down the cliffs from a height of around 4000 ft. The tourists have great fun enjoying the falls and swimming in the pool with cold waters. Danaulti is situated about 25kms from Mussoorie and is a lush green area surrounded by oak and deodar forests. This cool and calm spot is a great location for a peace of mind from the crowd of the market place. The place is covered by heavy snow during winters. Large number of people flock this place all round the year to have fun with friends and family. Situated around 55 kms from this place is another tourist spot known as Nag Tibba. Covered with thick forest, this is a great place for trekking and a number of trekkers throng this place all year round for great adventure. One has to drive 34 kms and then further trek 21 kms to get to the Naga Tibba. The very famous Surkanda Devi Temple is situated about 35 kms form Mussoorie. One has to trek 2 kms up the steep hill from Kaddukhal to reach the temple. Hundreds of tourists and devotees visit the temple each year especially during March to May to celebrate the Ganga Dussehra fair. Situated around 15 kms form Mussoorie is the Bhadraj Temple which is dedicated to Lord Bal Bhadra, the Lord Krishna’ brother. Trekkers find it the great place for trekking due to its dense forest and greens all along the way. One can have a great glimpse of the Chakrata and the Jaunsar ranges right from the top of the place. The sanctuary is situated around 12 kms from this place which was established in 1993. Covering an area of about 340 hectares, it is famous for the endangered Mountain Quail or Pahari Bater. The Yamuna Bridge is situated around 26 kms form Mussoorie and is on the Chakrata – Barkot way. This the great place for tourists who enjoy fishing and wants to enjoy nature in the cool and calm place. 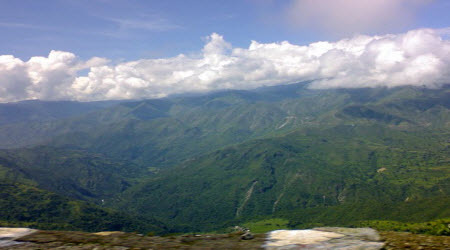 Places to Visit can provide you with more on Tourism in Mussoorie Dehradun.